Genie aerials provide high-angle opportunities above the fields, above the crowds At the ESPN Wide World of Sports Complex, located in the middle of the Walt Disney World Resort near Orlando, Fla., professional and amateur athletes from around the world visit the 220-acre athletic complex daily for the ultimate sports experience — a truly magical experience for many of them. Broadcasters covering youth sports competitions at the complex aim to provide remote viewers with shots and angles of the live action similar to what they would experience watching a pro sports event. To get all of the dramatic live footage, Mark Begonia, Production Manager, ESPN Wide World of Sports Complex Production Center, and his team employs state-of-the-art broadcasting equipment and a fleet of Genie lifts. “Our broadcasters and analysts want wide angle views of the players on the field to see and breakdown all of the plays happening for their viewing audience,” says Begonia. “To do that, our production staff has to get our cameras above the crowds and above the fields, at high angles, to capture as much of the action as possible. It is our job to provide a perch for them, high above the sidelines and the end zones, for our videographers to capture footage of the teams in action. Begonia and his staff rely on the versatility in the height and outreach of Genie boom lifts and scissor lifts to help them get those high-angle shots that will transport viewers from their couches to the competition. For example, Begonia says that his team uses Genie boom lifts to get specialty shots on rectangular fields, during football games and soccer matches, because the booms allow the camera operators to reach up and over the field of play, zooming in on the exciting moments. The boom lifts are also stationed in the end zones, elevated 40 ft and up, to capture the hero shots. During cross country meets, Begonia’s staff uses Genie boom lifts to get the cameras up and over the tree line so broadcasters and viewers can see the runners on the course. “Depending on the event, we will often use 2-6 Genie lifts per broadcast. The bigger the area we want to cover, the more lifts we use,” he continues. According to Begonia, the team uses Genie scissor lifts on the complex’s ball fields, covering baseball and softball games from the outfield and behind home plate. During cheerleading and gymnastics events, the scissor lifts are used to help broadcasters get high, wide angle views of the competition mats from the judges’ table. ESPN Wide World of Sports Complex Production Center staff also uses a Genie telehandler to move materials and equipment around the complex. The sports complex staff at Disney is tasked daily with completing projects that require them to work from elevated aerial work platforms, including flag and banner changing, sign installation and repair, rigging for events, lighting and speaker installations, camera and speaker positions for events, scoreboard maintenance, as well as unloading and moving of materials. All lifts at the sports complex are operated following safe-use guidelines issued by Genie and regulating industry agencies. 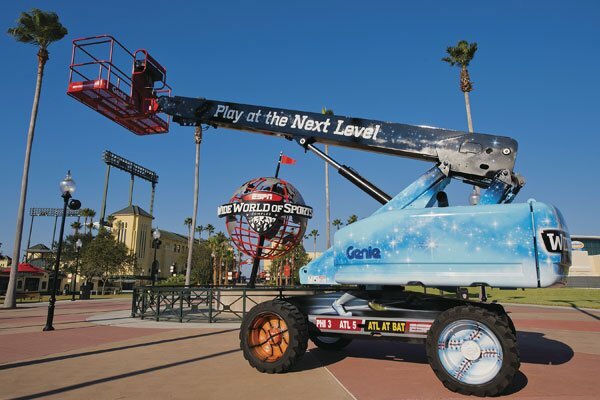 To aid the production team’s efforts, the ESPN Wide World of Sports Complex utilizes several Genie aerial lifts, including an S-60X telescopic boom lift, an S-85 telescopic boom lift, a Z-45/25 articulated boom lift, a GS-69 RT scissor lift and a GTH-5519 telehandler, as well as a Terex RL-4 light tower. When Begonia and his team need to ramp up their aerial fleet, they call on their local rental store, Sunbelt Rentals, to rent additional Genie units that will allow them to accommodate different broadcast requirements. Since most of the venues are outdoors, Begonia and his team have to take Florida weather conditions — often breezy — into account. Keeping the cameras still during the broadcasts is a major undertaking. The production staff relies heavily on the heavy-lift capabilities, as well as enhanced stability provided by the outriggers, on the Genie lifts to keep the platforms level and even to keep the operators safe and the cameras in place during the broadcast. ESPN Wide World of Sports Complex is a state-of-the-art facility with a worldwide reputation for hosting the best, most memorable sporting events for athletes of all ages and abilities. 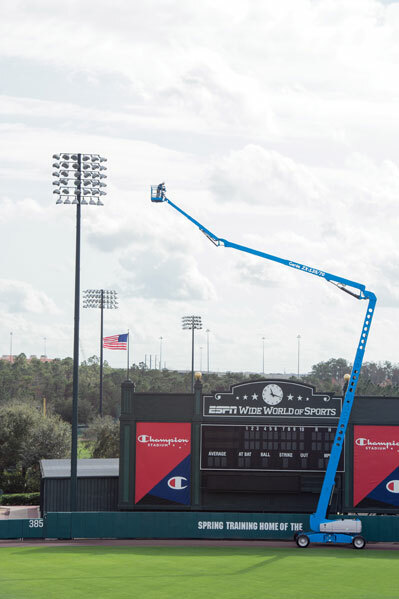 To provide the ultimate sports experience for athletes, their families, coaches and fans — both in the sports complex and at home — Begonia and his staff rely on Genie aerial lifts to give viewers the VIP treatment in each and every broadcast.